The history of Bidston Hill is all about line of sight communications. From Bidston Hill, one can see (and be seen) for many miles in all directions. Fire Beacons have been deployed on Bidston Hill for centuries. We know they were prepared as part of an early-warning system during the Spanish Armada and again during the Napoleonic Wars. They may have been used even earlier. In navigation, the Windmill on Bidston Hill was used as a “day mark” long before Wirral’s first lighthouses were built in 1763. This is why many early sea charts of Liverpool Bay took pains to mark the location of Bidston Windmill. The Bidston Signals comprised more than a hundred “lofty flagstaffs” running along the ridge of Bidston Hill. Their purpose was to give the port of Liverpool notice of arriving ships. 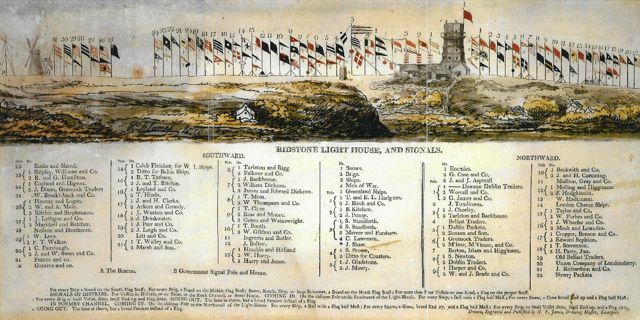 Bidstone Lighthouse and Signals, by Henry F. James, c. 1807. The original is in the collection of the Williamson Art Gallery. Lighthouses, too, depend on line of sight. To be useful, they must be seen. Liverpool’s first lighthouses were built in Wirral in 1763. These were navigational aids, not warning lights. By setting a course with the two lights straight ahead, mariners avoided the treacherous sand banks of Liverpool Bay. The two Sea Lights, near Leasowe, marked the safe passage through the Horse Channel, and the two Lake Lights marked the way into Hoyle Lake. This was an early (but not the earliest) use of leading lights in navigation. 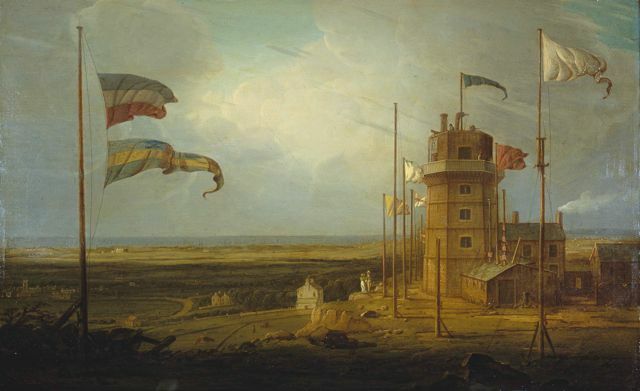 The first Bidston Lighthouse was built in 1771, near the Signals Station. It was needed because the lower Sea Light had been overwhelmed by storms. Bidston Lighthouse became the upper Sea Light, and Leasowe Lighthouse, still standing today, became the lower Sea Light. Being 2.3 miles further inland, the new lighthouse depended on a breakthrough in lighthouse optics, which came in the form of William Hutchinson’s invention of the parabolic reflector. In 1826, the Liverpool to Holyhead telegraph was set up. This was an optical telegraph, based on a new semaphore system devised by Lieutenant Barnard Lindsay Watson. It comprised a chain of semaphore stations at Liverpool, Bidston Hill, Hilbre Island, Voel Nant, Foryd, Llysfaen, Great Ormes Head, Puffin Island, Point Lynas, Carreglwyd, and Holyhead, a distance of 72 miles. It was capable of relaying a typical message from Holyhead to Liverpool in a few minutes, and a very short message in less than a minute. This was the first telegraph in Britain to carry commercial and private correspondence. Watson’s code was a numeric one: each station in the 1826 telegraph had a massive semaphore mast about 50 feet tall, each pole had three pairs of movable arms, and each pair of arms could signal a single digit. The 1841 telegraph had a two masts each with two pairs of arms, and a larger vocabulary of 10,000 words. All of these systems were made obsolete by the inexorable march of technology. Last to arrive and first to go was the optical telegraph, which was superseded when the electric telegraph linking Liverpool to Holyhead was finally completed in 1861, the first cables having been laid in 1858. Next to go were the signal flags. The Sea Lights were superseded by navigational buoys, which had the virtue of being moveable. By 1908, when the Lower Sea Light at Leasowe was extinguished, the sandbanks had shifted to such an extent that the Horse and Rock Channels were barely navigable, and the Sea Lights no longer provided a useful leading line. The Upper Sea Light on Bidston Hill shone alone for another five years, until sunrise on 9th October, 1913. Radio is another form of communications that depends on line of sight. The principle of propagation of electromagnetic waves was discovered by James Clerk Maxwell in 1873, the same year that the present Bidston Lighthouse was completed. Marconi won an important patent in 1896, and built the first radio station on the Isle of Wight in 1897. Then it really took off. At Bidston Lighthouse (and Bidston Observatory), radio antennae of all kinds have been installed at one time or another. Mersey Docks ordered a set of “Marconi Apparatus” for Bidston Lighthouse as early as 1908, but the Marconi Company failed to deliver, and the order was withdrawn. An antenna, probably marine, is still attached to the north face of the lighthouse tower. Amateur radio enthusiasts, notably the Wirral Amateur Radio Society, still operate from Bidston Lighthouse on annual International Lighthouse and Lightship Weekends, and other special occasions. Our webcam is brought to you over a line-of-sight wireless network. 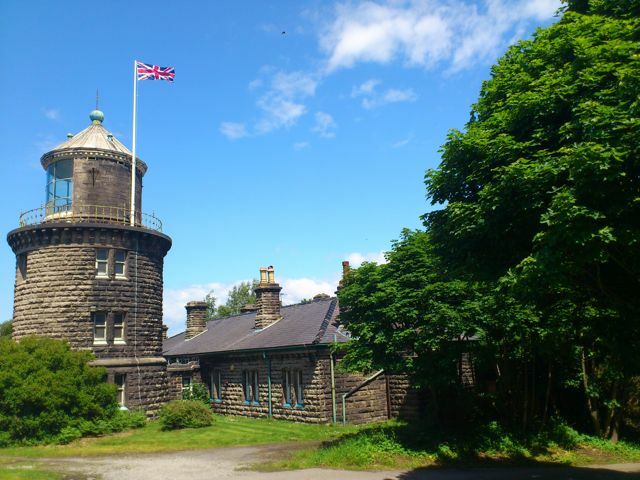 In 2014, Wirral Radio 92.1 FM moved their transmitter to Bidston Lighthouse. Line-of-sight communications are as much a part of the future of Bidston Lighthouse as its past. This entry was posted in Bidston Hill, History, Lighthouse, News and tagged Beacons, BidstonHill, BidstonLighthouse, Communications, History, Liverpool, Radio, Semaphore, Signals, telegraph on 2nd April 2014 by admin. 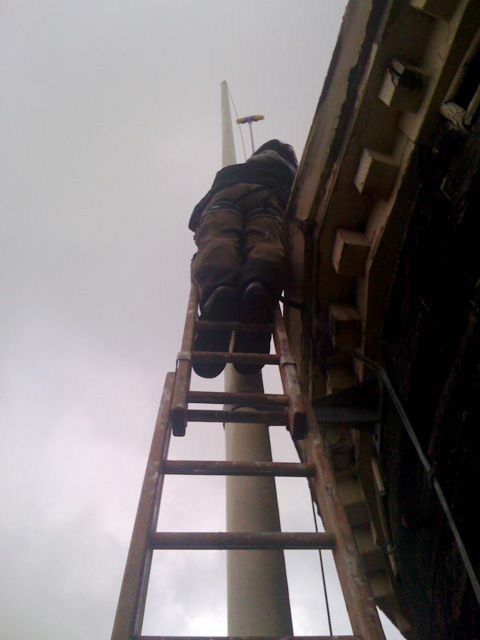 Thanks to the efforts of the fearless Dave Parsons, one of only two Flagpole Engineers in the country, the flagpole atop Bidston Lighthouse is back in service. Yesterday, I hoisted the Union Flag to celebrate the Queen’s Diamond Jubilee. No beacons were lit on Bidston Hill this Jubilee. But a few of us did gather on top of the Lighthouse to watch the lighting of beacons across the region. We saw beacons as far afield as Mount Snowdon and Scafell! This entry was posted in Lighthouse, News and tagged Beacons, BidstonHill, BidstonLighthouse, Flagpole, Jubilee on 5th June 2012 by admin. The three men were William Urmson, Richard Urmson & William Corfe. They were paid 2 shillings per day each, and shared a fuel allowance of 9 pence per day. 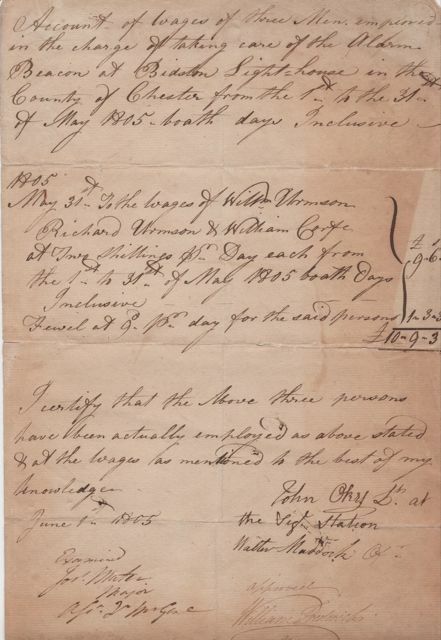 The bill was signed by John Oky Lt. at the Signal Station, and approved by William Frederick Lt. Gen. I assumed at first that this was just the normal wages of the lighthouse keepers on Bidston Hill. But why did the bill talk about the Alarm Beacon? The lamp in Bidston Lighthouse might well be called a beacon, but its purpose, when lined up with Leasowe Lighthouse, was to light a safe passage through the channels of Liverpool Bay, not to warn off approaching shipping. And why were the men being paid through the army? Was this another kind of beacon altogether? I already knew that William Urmson was the keeper of Bidston Lighthouse from 1797 until 1835. Richard Urmson was probably William’s son by his first wife Mary, Richard Wilding Urmson (1789-1817). The Corfe family have long been associated with farming on Bidston Hill. It turns out that William Frederick, who then had the rank of Lieutenant General in the Army, was none other than the great-grandson of King George II, soon to inherit the duchies of Gloucester and Edinburgh, and later to be known as “Silly Billy”. In May 1805, Britain was at war with Napoleon, George III was on the throne, and Nelson was an Admiral in the Royal Navy. The French fleet had just broken the British blockade at Toulon in April, and were at large in the Atlantic. The Battle of Trafalgar (21 Oct 1805) was yet to be fought. There were real fears of a French invasion, and preparations had been made throughout the land, including an extensive network of alarm beacons. This wasn’t the first time that beacons had been erected on Bidston Hill. In 1588, the year of the Spanish Armada, beacons were readied all along the coast of Britain, including one on the summit of Bidston Hill, and another at the top of Everton Ridge, overlooking the then small but important port of Liverpool. Beacons have often been lit across Britain to celebrate historical events, including Queen Victoria’s Diamond Jubilee (1897), the 400th anniversary of the Spanish Armada (1988), the Millennium, the Queen’s Golden Jubilee (2002), and the 200th anniversary of the Battle of Trafalgar (2005). As I write this, preparations are being made for the Queen’s Diamond Jubilee celebrations. Already, more than 2600 sites have signed up to light a beacon between 22:00 and 22:30 on the evening of 4th June 2012. Will Bidston Hill join in? The possibility is still being discussed. At first it sounds like a lot of fun, but what if the fire gets out of control? 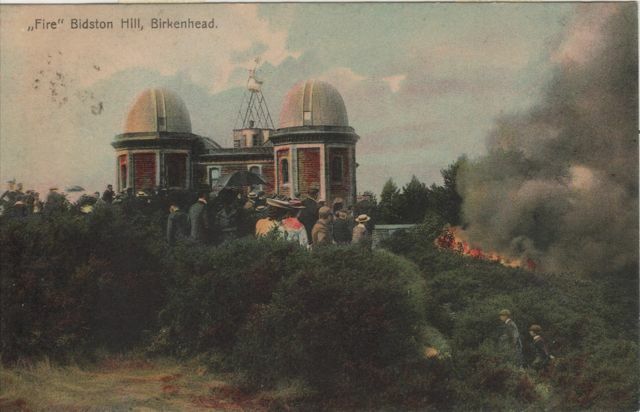 Fire has always been a problem on Bidston Hill. In the summer, the gorse dries out, catches fire easily and spreads rapidly when fanned by the stronger-than-average winds that Bidston Hill is exposed to. A fire, apparently extinguished, can smoulder in the peat deposits, travel underground and break out somewhere else. It is difficult, sometimes impossible, to bring fire engines close to the blaze, and the water pressure at the few hydrants on the hill is low. So as much as I’d like to see a beacon lit on Bidston Hill this jubilee, I’ll understand if caution prevails. This entry was posted in Bidston Hill, History, Lighthouse, News and tagged Beacons, BidstonHill, BidstonLighthouse on 25th April 2012 by admin.